Formation of Si nanocrystals in amorphous Si-metallic Sn film structures has been studied experimentally, by using the Auger spectroscopy, electron microscopy, and Raman scattering methods. The results are analyzed in comparison with recent results on the crystallization of tin-doped amorphous Si. A mechanism of silicon transformation from the amorphous to the nanocrystalline state in the eutectic layer at the Si–Sn interface is proposed. The mechanism essence consists in a cyclic repetition of the processes of formation and decay of the Si–Sn solution. The application aspect of this mechanism for the fabrication of nanosilicon films used in solar cells is discussed. M.A. Green, K. Emery, Y. Hishikawa, and W. Warta, Prog. Photovolt. Res. Appl. 19, 84 (2011). D.L. Staebler and C.R. Wronski, Appl. Phys. Lett. 31, 292 (1977). M. Jeon, C. Jeong, and K. Kamisako, Mater. Sci. Technol. 26, 875 (2010). O. Nast and A.J. Hartmann, J. Appl. Phys. 88, 716 (2000). A. Chandra and B.M. Clemens, J. Appl. Phys. 96, 6776 (2004). F. Lin and M.K. Hatalis, MRS Proc. 279, 553 (1992). V.B. Neimash, A. Kraitchinskii, M. Kras'ko, O. Puzenko, C. Claeys, E. Simoen, B. Svensson, and A. Kuznetsov, J. Electrochem. Soc. 147, 2727 (2000). V.B. 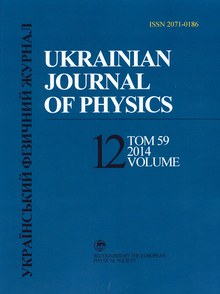 Neimash, A. Kraitchinskii, M. Kras'ko et al., Ukr. J. Phys. 45, 342 (2000). C. Claeys, E. Simoen, V. Neimash, A. Kraitchinskii, M. Kras'ko, O. Puzenko, A. Blondeel, and P. Clauws, J. Electrochem. Soc. 148, G738 (2001). E. Simoen, C. Claeys, V.B. Neimash, A. Kraitchinskii, N. Krasko, O. Puzenko, A. Blondeel, and P. Clauws, Appl. Phys. Lett. 76, 2838 (2000). E. Simoen, C. Claeys, A.M. Kraitchinskii, M.M. Kras'ko, V.B. Neimash, and L.I. Shpinar, Solid State Phenom. 82, 425 (2002). M.L. David, E. Simoen, C. Claeys, V. Neimash, M. Kras'- ko, A. Kraitchinskii, V. Voytovych, A. Kabaldin, and J.F. Barbot, J. Phys. Condens. Matter 17, S2255 (2005). D. Girginoudi, N. Georgoulas, and F.J. Thanailakis, J. Appl. Phys. 66, 354 (1989). A. Mohamedi, M.L. Thye, M. Vergnat, G. Marchal, and M. Piecuch, Phys. Rev. B 39, 3711 (1989). G.N. Parsons, J.W. Cook, G. Lucovsky, S.Y. Lin, and M.J. Mantini, J. Vac. Sci. Technol. A 4, 470 (1986). R. Ragan, K.S. Min, and H.A. Atwater, Mater. Sci. Eng. B 87, 204 (2001). K.A. Johnson and N.W. Ashcroft, Phys. Rev. B 54, 14480 (1996). M. Vergnat, M. Piecuch, G. Marchal, and M. Gerl, Phil. Mag. B 51, 327 (1985). S.Yu. Shiryaev, J.L. Hansen, P. Kringhyj, and A.N. Larsen, Appl. Phys. Lett. 67, 2287 (1995). R.W. Olesinski and G.J. Abbaschian, Bull. Alloy Phase Diag. 5, 273 (1984). A. Mohiddon and G. Krishna, Crystallization – Science and Technology, edited by M.R.B. Andreeta (InTech, 2012), p. 461. A. Mohiddon and G. Krishna, J. Mater. Sci. 47, 6972 (2012). V.V. Voitovych, V.B. Neimash, N.N. Krasko, A.G. Kolosiuk, V.Yu. Povarchuk, R.M. Rudenko, V.A. Makara, R.V. Petrunya, V.O. Yukhimchuk, and V.V. Strelchuk, Semiconductors 45, 1281 (2011). V.B. Neimash, V.M. Poroshin, O.M. Kabaldin, P.E. Shepelyaviy, V.O. Yukhymchuk, V.A. Makara, and S.U. Larkin, Ukr. J. Phys. 58, 865 (2013). V. Neimash, V. Poroshin, P. Shepeliavyi, V. Yukhymchuk, V. Melnyk, A. Kuzmich, V. Makara, and A. Goushcha, J. Appl. Phys. 113, 213104 (2013). H. Richter, Z.P. Wang, and L. Ley, Solid State Commun. 39, 625 (1981). H. Cambell and P.M. Fauchet, Solid State Commun. 58, 739 (1986). A. Hiraki, Surf. Sci. Rep. 3, 357 (1984). M. Hillert, Acta Metallur. 9, 525 (1961). A.G. Milnes, Deep Impurities in Semiconductors (Wiley, New York, 1973). G.F. Wakefield and H.S. Nagaraja Setty, Patent US 3933981 A (20.01.1976). I.E. Maronchuk, T.F. Kulyutkina, and I.I. Maronchuk, Patent UA 84653 (16.02.2010).